1) There must be broccoli & rice casserole. I can bring roasted broccoli for a healthier broccoli dish. But it has to be served alongside of – not instead of – the casserole. 2) I must make the broccoli & rice casserole. Me. Shawnda. We spend every other Thanksgiving day with Jason’s family and every other Thanksgiving day, my little brother complains about how the casserole just isn’t the same. Even though it totally is. Except that one time my sister messed it up. I won’t embarrass her to the world… but her “fix” might have involved stirring in uncooked non-instant rice to firm things up about 27 seconds before it was time to eat. Crunchy casserole = no bueno casserole. And a whiny little brother. 3) Don’t mess with the broccoli & rice casserole recipe. The temptation, it’s great with this one. It’s loaded with not-real cheese, more butter than it needs, one of the maligned cream-of soups, and scandalously white rice. It’s not fancy but it’s tradition and it’s delicious and it’s a family (especially little brother) favorite. So this year, I’m totally messing with the broccoli & rice casserole. It’s hard to disown a family member when you’re actually eating dinner at her house, right? Right? And I’m not doing it to be a jerk. For serious. I’ve always wanted to make the dish a little more healthful – a task that at Thanksgiving, always feels like shooting a BB gun at a freight train. But after eating a bowl of it for dinner the other night, I have very little doubt that my little brother will be more than “just” fine with a less-processed version. The texture of the quinoa is similar to rice. There’s still plenty of cheese. The top of the dish still gets those little crisped brown bites that he sneaks into the kitchen and steals before the rest of dinner is ready. There’s still plenty of that one bowl, creamy comfort food factor going on. And more importantly, there’s plenty of real food going on. Or I could be completely wrong and my little brother will be holding auditions for the role of new big sister before the first football is in the air on Thanksgiving. 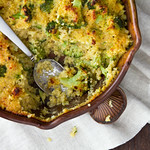 Rich, cheesy, and comforting, this less-processed version of broccoli and rice casserole uses quinoa and real cheese and is made without cream of mushroom soup. Make it a one-dish meal and add leftover shredded chicken! In a medium sauce pan, cook the quinoa in water with a generous pinch of salt, according to package, directions and then set aside. In a large pot, add the broccoli and a couple of inches of water. Cover the pot, bring to a boil for 1-2 minutes, and then drain and rinse with cold water. Return the drained broccoli to the large pot and add the quinoa. In a saute pan over medium heat, melt the butter. Whisk in the flour, onion, garlic, mustard, cayenne, a generous pinch of salt and black pepper. Let cook 1-2 minutes and then slowly add the milk, whisking until the sauce is smooth. Let the sauce simmer, reducing the heat if necessary, about 5 minutes until thickened and bubbling. Remove from heat, whisk in the cheddar a handful at a time until completely melted. Pour sauce over broccoli-quinoa mixture and toss to coat, mixing well. Transfer mixture to a casserole dish and bake 35-30 minutes, until the top is nicely browned. This might even pass if I make it for the less-adventurous side of our family. Cross your fingers and hope that I am not disowned and maligned, please! I just made this, too. I love your adaptation with the Creole mustard. We’ve already talked about wanting this dish again, so I’ll have to try your way! My dry mustard powder that the recipe originally called for was impressively passed its expiration date. Didn’t even smell like anything. And that’s a problem I’ll never have with as fast as I go through creole mustard! Love this –looks like great comfort food but with a healthy twist! 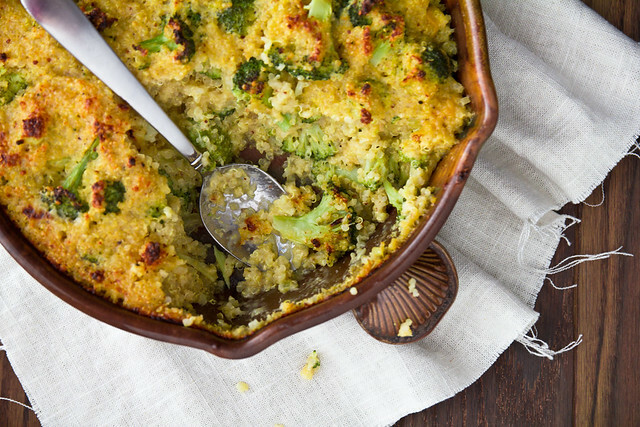 Love this healthful take on a traditional Thanksgiving dish! I hate to admit it, but sometimes pretend cheese makes the dish what it is supposed to be. It’s terrible, but it’s terribly right. I like this fancied up version though! It’s always so cool to see other people’s family traditions. This looks delicious! It just might look good enough for my husband to give up his fake cheese version……maybe! This. This looks amazing and I’m going to have to make it tonight. And I’ll definitely make sure to enjoy the crispy brown bits from the top too! I made this two times in one week when I first saw it on Annie’s Eats. It is so delightfully yummy. Hope little bro thinks so too. I can’t wait to try this for lunch. My daughter is a vegetarian and this will definitely be making it’s way to our holiday table also! Thanks! That’s how my brother is about my cranberry sauce. He (a) insists that I make an extra quart of it for him to bring home with him and (b) would probably cry and/or murder me if I ever tried to change it. I think springing THIS recipe on him, though, would make me sister-of-the-year. Cheese AND broccoli? Who could resist! I may have to add this to our Thanksgiving menu! Looks great. I love how this looks! I usually enjoy foods that have Velveeta in them every once in a while, but I like to use better ingredients when I’m in charge as well. Thanks for the recipe, this was a delicious side dish. I used a gluten free flour mix instead of AP flour to keep this recipe GF. Loved that the top was slightly crunchy and the center stayed moist and cheesy (even after sitting out for 15 minutes). Great dish, the family enjoyed it and I will definitely be making it again. Would this recipe work with cubed chicken to make it like a chicken and rice casserole? I have it in the oven now…….hold me back, it is going to be great! This was off the hook! I used a creole conjac mustard, and a mild white cheddar because it’s what I had. So good…. And I took to work for leftovers too! Reheats very well…. Will be making this regularly. Nutritional information of this recipe would really be nice. If anyone knows it – would you be willing to share? I didn’t calculate it for this recipe – but I use SparkRecipes.com when I do. I live in a tiny apartment and don’t have an oven, do you think I could just add the sauce to the quinoa and broccoli without baking it? Would you use of 8×8 or 9×13 casserole dish for this? Hi, Shawnda. This looks amazing! Just curious — can you be more specific about how much broccoli to use? I buy ours at the farmers market, where a head is sometimes much smaller than what you get at the store. Thanks! Say, 12-14 oz of florets? If I weren’t using fresh broccoli, I’d just grab a ~12oz frozen bag of florets.